✔PREMIUM MATERIAL: Locket pendant and 24″/60cm chain (with 2″/5cm extender) is made from surgical grade 316L stainless steel, which is hypo-allergenic, healthy, fadeless and durable. Buy with confidence! ✔STUNNING PENDANT: 30mm (approximately 1″) in diameter, our stunning pendants release essential oils wherever you are! The pendant opens from the side like a locket with two strong magnets closure. Solid back insure you never have to worry about getting oil on your clothes. ✔NON-TOXIC PADS: 7 pcs high quality non-toxic refill washable pads in different colors are included. One day one color makes you different lookings and smelling everyday within one week. You could add same essential oil onto same pad constantly,so the oil can not be mixed. 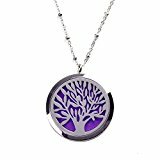 ✔GREAT GIFT: Aromatherapy essential oil diffuser necklace is perfect gift for yourself, lover, family and friends. Combines beautifully crafted diffuser necklace with 7 refill pads packaged in a nice gift bag. ★WHY DO YOU NEED A DIFFUSER NECKLACE? It’s not practical to always carry your big bulky diffuser with you and finding an outlet is not always an option. Now you can simply WEAR your diffuser! Diffuser necklaces allow you to keep the benefits of essential oils with you all day! ●As a perfect gift for yourself, lover, family and friends. ●Beautifully designed for any occasion. Note:The size is measured manually,a little deviation is normal,please prevail in kind! ●Package: OPP Bag + Free Gift Bag. All the jewelries should adopt this protection method: Earliest taking down and latest putting on. Here are 3 tips for you to wear and protect your jewelry correctly. 1. Avoid making your jewelry get in touch with mordant liquid as far as possible,such as perfume,sweat,cleaner,sanitizer,shower gel when wearing. 2. To keep the gloss of your jewelry, you’d better to wipe it with clean and soft dry cloth after wearing. 3. Put your jewelry in your jewelry case to prevent it from contacting sunlight and damp air when you are not wearing jewelry for a long time.